Weep for microsoft if old. 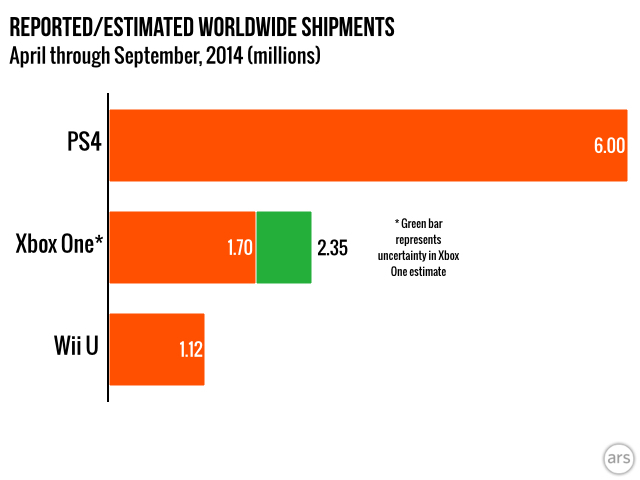 both Wii U and the Xbox One sales have been absolutely dwarfed by the PlayStation 4 in recent months. The PS4 has shipped roughly 63 to 68 percent of all "current generation" consoles in recent months. That's significantly better than the (still impressive) 48 to 49 percent of the shipments that Sony can claim over the life of the current console generation. In fact, the shipment of six million PlayStation 4s from April to September is only slightly below the lifetime shipments for either the Xbox One or Wii U, and that should tell you something about how well Sony's system has been doing of late. From the same guy who told us to not read too much into the early PS4 sales. Predictions are harder then facts. Ask patcher. Cerny needs to go to the OS division and shake things up as those guys are garbage. Happy for Sony. Invest some of that money into your OS and the other half into Square Enix to finish FFXV and KH3. Why not? Do you have a legitimate counter argument? Wii U doing better than I imagined, I thought it was like completely dead. Practically within spitting distance of the XBO. Those numbers don't count digital or bundles. For some, I believe the opposite applies. Destiny PS4 bundles never counted towards that number. MS was giving away Destiny for free.. Still more people playing on PS4, though, if you count the bundle. Also, what constitutes "a lot more"? Did we ever hear numbers? Not really free since the bundle was 450 dollars, not 400. Destiny bundles don't count, whereas the free Destiny MS was giving out does. That probably had an influence on that, not to mention that, as you said, that is only in the US. Also, good lord Sony is back when it comes to market control. He means that MS was giving away a free game to everyone who bought an XB1 the week of Destiny's launch. Nice stats to back that up. Destiny did not sell a lot more on xbox one. bundles for PS4 and digital for both weren't even counted. Good. I'm very glad the most powerful console is leading in sales. I hope this means the audiences are starting to pay attention to hardware and game specs. Didn't Activision already say more people playing Destiny on PS4 then on any other platform? Good on them to update their article instead of just keeping the old one around. I suspect he's overestimating the 360 portion of Microsoft's combined 3.5 million shipment figure from July-September. 1.15-1.8 million just seems really high given ps3 only shipped .8 million. If that's the case, his XB1 shipment estimate is a bit low. Not that that changes his overall point. Just thought those numbers were odd. I'm honestly not sure that MCC + $50 discount will be enough for XB1 to beat PS4 in November. Will be interesting to see. MS is creeping up on Sony. Right, good job excluding the thousand of bundles that included the game and weren't included. And the press release by Activision, too. From Sep. 7 to 13 there was a free game offer if someone bought an Xbox One. Some places had Destiny as one of the free games. Don't forget the unofficially bundled copies for XB1 NPD presumably did count. In this unusual situation, NPD's data probably paints an inaccurate picture. Yep. Hasn't the PS3 has been outselling the 360 WW so the numbers are a bit questionable? Yeah, I thought it might but when you just look at that graph, it's really hard to imagine even Halo and a price drop swinging things so drastically that the XB1 bar is ahead of the PS4 one, even for a month.